Learn to make goals the Work the Plan way. Even when – especially when – life doesn’t go according to that plan. But too often, we make plans and then never look at them. Too often, we set unrealistic expectations and kick ourselves when they fall apart. sit on the counter, neglected. don’t help when the day goes haywire. take more time to make than to do. reflect our moods instead of our responsibilities. We need to work the plan – the plan that will work with us, not against us. center on our responsibilities rather than our aspirations. help us make intuitive choices about what to do next, even when we can’t look at the list. never leave us feeling like a failure when all the boxes aren’t checked. build habits that support us. We need plans, habits, and approaches made for moms at home, where life is unpredictable and our job is meeting needs not completing projects. I have read a lot of organizing books and blogs and the thing I love about YOURS and that stands out to me is that you have the perspective of a homeschooling mom! And as you know, some organizing issues are specific to homemakers and homeschoolers. Your wisdom and advice is SO HELPFUL. – Catie N.
This is some of the best money I have ever spent on a course or planner! I have been so frustrated for years with all the things in my head and not knowing what to do when I have time. This material has really had me go deeper to attack root issues that were the problem. – Melody V.
There is so much practical wisdom that speaks directly to me as a homeschooling mum. I wasn’t sure about doing an online course but I am so glad I decided to give it a go. It has helped so much already. More than anything it has helped me think about my responsibilities in a new way. – Tania B. 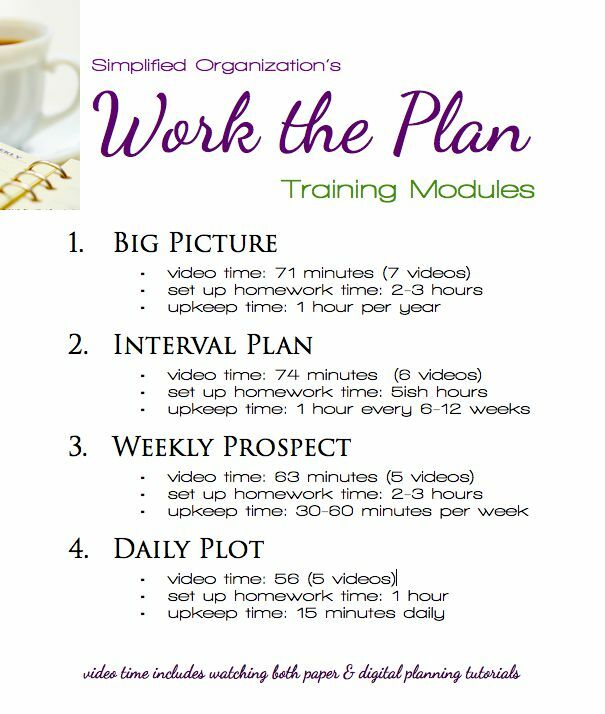 Work the Plan is a video training course that have you crafting and using a plan that makes you more effective and less stressed, every day. Making a good plan doesn't need to take a lot of time or be complicated. This straightforward class will have you supercharging your days right from the start. Download the course syllabus. I want you to be happy. I offer a 30-day 100% money-back guarantee, no questions asked. If it doesn't work for you, let me know and I will refund your purchase. Is the content in this course Christian? It is written from a Christian perspective, but explicit references come out only in the introduction, the conclusion, and the module on vocation. This course is primarily practical rather than foundational. Does this include help for my homeschool plan? The Premium membership includes an extra module on working your homeschool plan. How long will it take to complete Work the Plan? Simplified Organization: Learning to Love What Must Be Done is a self-paced course, so you can power through it or take your time. With four modules, working through the materials will take a minimum of one week, but most members take one or two weeks per module. Some people work through the whole course quickly the first time around to get a sense of the whole, then return to the beginning and slowly incorporate each piece into their rhythms.The member forums are a great place to get accountability as you work through the material, no matter how fast or how slow you choose to go. Membership never expires. You will receive a registration email to click through and set up a username and password. Then you can login at the "Members" link at the top of any page on the site to access the course and the forum. MP3s and pdfs can be downloaded if desired. How is Simplified Organization different from Work the Plan? The Simplified Organization: Learning to Love What Must Be Done course is more deep and thorough to getting after your why and your attitude and fixing things from the inside out. It's much more encouraging and basic. It's written for women who are discouraged in their homemaking, feel like they never get any traction, and don't even know where to start.Work the Plan is all about getting your plan and your act unstuck. It assumes you know what you should be doing (Simplified Organization: Learning to Love What Must Be Done walks you through figuring that out from scratch), but you know you could be more effective. It's written for those who feel like their planning is busy work that isn't the help it should be in their daily life. It's all and only about how to get your plan in order and then use it so it's a tool to make you more effective.They do work together, and Work the Plan would be a good final module to go through after Simplified Organization: Learning to Love What Must Be Done. Simplified Organization: learning to Love What Must Be Done has the planning pieces, but less thoroughly. Work the Plan is all about, well, working the plan, and it's very straightforward with no other distractions or topics (like figuring out housekeeping routines that work, which is in the main course).